It's well-known how misleading it can be to use average (mean) as a summary measure of income: the distribution is very skew, and a few very rich people can hopelessly distort the mean. So median (the value halfway along the distribution) income is generally used, and this might fairly be described as the income of an average person, rather than the average income. But, like everyone else dealing with actuarial statistics, I use life expectancy (the mean number of future years) to communicate someone's survival prospects. And yet, just as for income, it is also a poor measure due to the skewness of the distribution of survival. 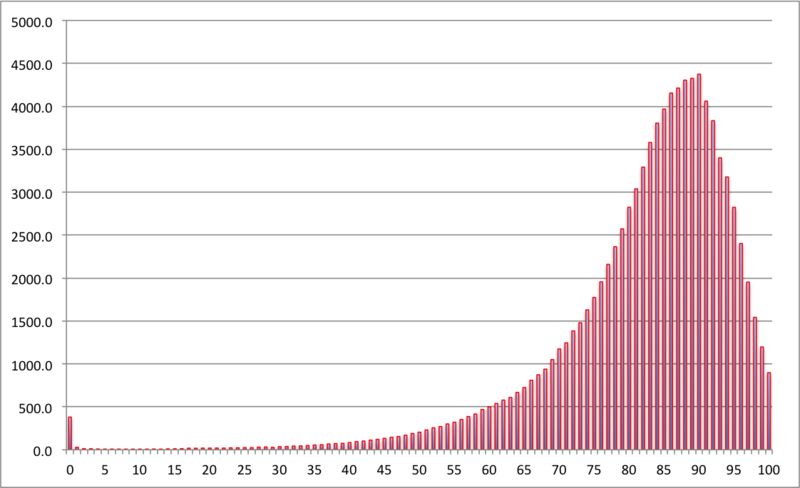 This can be clearly shown by looking at the life tables published by the Office for National Statistics (ONS) : these have a convenient column labeled $d_x$, which is the probability density for survival, expressed as the expected number of deaths at each age out of 100,000 births, assuming the current mortality rates continue. The density plots for women and men are shown below, using the life tables for 2010-2012. The distributions have a small peak for babies dying in the first year of life, and then a long left-tail for early deaths, and then a sharp peak and a rapid fall up to age 100. The ‘compression’ of mortality is clear. Numbers of women expected to die at each age, out of 100,000 born, assuming mortality rates stay the same as 2010-2012. 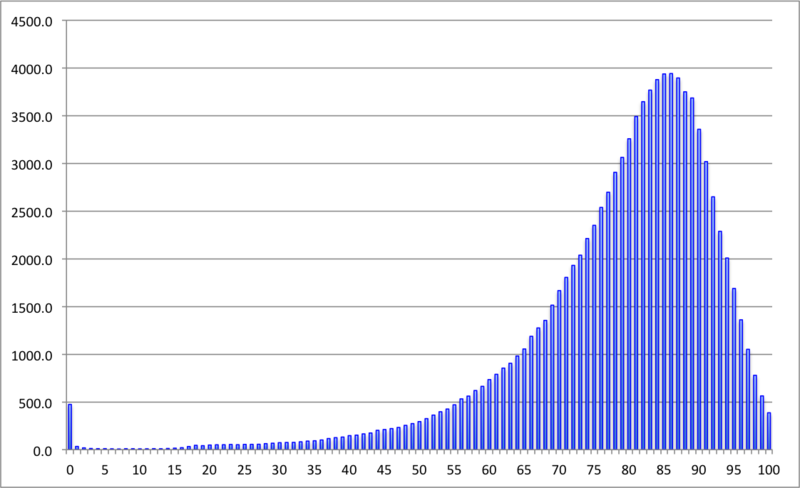 The expectation is 83, median 86, the most likely value (mode) is 90. Numbers of men expected to die at each age, out of 100,000 born, assuming mortality rates stay the same as 2010-2012. The expectation is 79, median 82, the most likely value (mode) is 86. Left-skewed distributions are rather unusual, but have similar issues as any skew distribution - the mean, median and mode can be very different. For these survival distributions it is perhaps remarkable how far the mode is from the mean: for girls born now, even assuming there are no more increases in survival, their most likely age to die is 90, seven years more than the mean on 83. For little baby boys the mode is 86, again seven years more than the mean of 79. And even the median is 3 years more than the mean. That's why I now believe that 'life expectancy' is misleading. Of course these ‘period life tables’ unrealistically assume mortality will stay the same in the future, whereas life expectancy has been growing at around 3 months a year for decades, corresponding to the annual risk of death reducing at about 2% per year. The ONS also provide ‘cohort life tables’ that make various projections about whether these trends will continue in the future: the 'central projection' says girls born now have a life expectancy of 94, with (according to my rough calculations) a median and mode of around 100, and men have a life expectancy of 91, with a median and mode of around 96. Under the ‘high' projections, with the possibly implausible assumption that the increases continue at the same rate in the future, children born today will on average live more than 100 years. Good luck to them - heaven knows how long they will have to work for. Thank you for highlighting this problem. It bothered me so much that after 20 years as an actuary I wrote a PhD about it. Period average life expectancy is misleading in the worst way - it leads to underestimation of how long we are going to live. This matters to individuals and in public policy. The problem is in the name - "life expectancy" is not necessarily the lifespan we should expect. de Moivre defined "expectation of life" in 1725 as more or less that, but the statistic has since proven useful as a summary measure of the health of a group at a point in time, for example it is widely used in health policy to compare across countries. So "life expectancy" figures get referenced a lot in the media, but very often used as if they tell us how long we should expect to live when that isn't what the statistic is actually measuring. See Longevity Bulletin 1 on actuaries.org.uk for more. I think the median beats the mean at every level and for all practical purposes, not only for estimating life expectancy or income. For large sample sizes (or if you repeat the experiment many times) the median approaches the mean anyway so nothing is lost by replacing the mean by the median everywhere. We use the average routinely for historical reasons only, not really for any rational reasons. Please see http://philpapers.org/rec/ERGTEO for more thoughts on this topic. I was looking for such graphs or probability functions for life expectancy. Do they have a special name? Im also looking for according graphs for the middle ages where child mortaility was much higher. Any idea where to look for these? Not sure if this is of help but my lecturer refers to these as bathtub curves where there are 3 observable phases: burn in, normal and wear out phase. There may, however, be some more commonly used alias/terminology.